I am an avid user of wet wipes. I will carry them everywhere with me. I can't go anywhere without wet wipes. 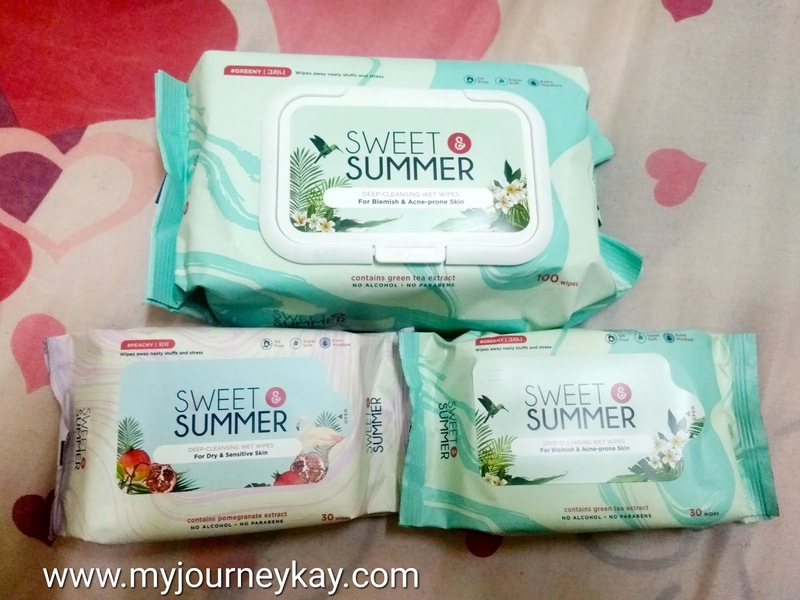 I have tried many brands of wet wipes but Sweet & Summer is new for me. I am attracted with Sweet & Summer deep cleansing wet wipes because it comes in two types. They are Greeny for blemish & acne-prone skin and Peachy for dry & sensitive skin. Greeny is enriched with green tea extract that clears away pore-clogging dirts and blemishes, leaving skin fresh and fabulous. Peachy is enriched with pomegranate extract for soothing and moisturizing, leaving skin healthier and bouncy like baby. This deep cleansing wipe gently cleans the skin from thick make up, impurities, nasty stuffs and negativity. It does not contain alcohol or parabens. It is KKM and Bureau Veritas approved. Quinoa Seed - Reducing wrinkles. Helps firm and tone skin. Collagen producing agent. Chia Seed - Skin conditioning agent. Soothing skin. Spanish moss - Wound healing. Oat extract - Skin soothing. Rich in source of protein. Wild Cherry - Antioxidant. Skin calming benefit. Cranberry - Anti inflammatory. Cell regeneration and cell activating. Raspberry - Tonic. Keratolytic. Astrigent. Dogwood fruit - Skin conditioning. Strong antibacterial. Pomegranate - High Level of Vitaminc C. Antioxidants. It is very easy to use this wipes. Just hold it softly over the face for a moment and gently wipe away make up, dirt and other impurities. It deep cleanse the skin with one easy wipe. It removes hard and thick mascara. It is super soft & comfy wipes which does not irritate the skin. Wet tissue with green tea extract. Interesting! yes it is very gentle on skin too..